The Alumnus/a of the Year Award was established in 1945. 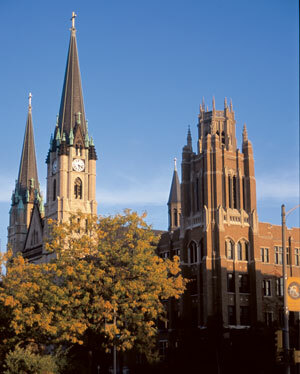 The criteria are: distinguished professional achievement, distinguished leadership, service to Marquette University, service to the community and loyalty to the ideals of Marquette University. This award remains the MUAA's premier alumni honor. The MUAA Board of Directors established this award in 1969. The criterion for the Alumni Merit Award is distinguished professional achievement. The MUAA Board of Directors established this award in 1969. The criteria for the Alumni Service Award are distinguished leadership and service to Marquette University. MUAA established the Community Service Award in 1979. The criterion is outstanding service to the community beyond Marquette University. MUAA presented the Spirit of Marquette Award for the first time in 1996. The criterion is professional and/or personal achievement before the age of 40. Service to the community and/or Marquette would be an enhancement but is not a requirement. Having received an Alumni Merit, Service, Community Service or Spirit of Marquette Award is neither a requirement for, nor disqualification from, being considered for the Alumnus/a of the Year Award. College deans, affiliate and associate alumni associations, national clubs, regional directors, university academic department chairs, Marquette University National Board directors, and the alumni body in general may suggest candidates for All-University Awards. The awards committee carries forward the names of candidates and keeps them on the active consideration list for three years. Those suggesting candidates are welcome and encouraged to submit additional information for candidates not selected in a given year. University employees are not eligible for All-University Awards consideration. MUAA National Board directors are not eligible for an All-University Award until they have been off the board for three years. Nominators need to make the case for their nominees. Nominating letters should be specific about why a nominee deserves the award. In most cases, the awards committee comes to know candidates only through the letters and articles the nominator supplies. The Distinguished Alumnus/a Award recognizes outstanding professional achievement and service to Marquette University or the larger community. The Entrepreneurial Award recognizes outstanding achievement as an entrepreneur. The A Person for Others Award recognizes outstanding service to the community. The Young Alumnus/a Award recognizes outstanding professional achievement before the age of 40. The Distinguished Alumnus/a Award recognizes outstanding professional achievement and service to Marquette or the larger community. The Professional Achievement Award recognizes outstanding professional achievement. The Community Service Award recognizes outstanding service to the community beyond Marquette University. The Service to Marquette Award recognizes outstanding service to Marquette University or the College of Business Administration. The Journalism By-Line Award honors an alumnus/a who has attained distinction in journalism and related fields. The Communicator of the Year Award recognizes exceptional professional achievement. The Professional Achievement Award recognizes an alumnus/a who has attained distinction as an entrepreneur or as a professional in a field outside of communication. The Young Alumnus/a Award honors significant professional achievement, personal responsibility, technical excellence and/or service to the university or community before the age of 40. The James T. Tiedge Memorial Award honors an alumnus/a whose professional life reflects the values Tiedge taught and lived, including the social responsibility of media professionals. The Distinguished Alumnus/a Award honors distinguished educational achievement and leadership in care for knowledge, care for profession, and care for person after the age of 35. The Counselor Education and Counseling Psychology Achievement Award recognizes professional achievement in the field of counseling and educational psychology, moral and professional character, and loyalty to the ideals of the university. The Educational Policy and Leadership Achievement Award recognizes professional achievement in the field of educational policy and leadership, moral and professional character, and loyalty to the ideals of the university. The Young Alumnus/a Award recognizes an alumnus/a under the age of 40 who demonstrates significant educational achievement and potential in care for knowledge, care for profession and care for person. The Distinguished Alumnus/a Award recognizes outstanding professional achievement and service to Marquette. The Service Award recognizes outstanding service to Marquette University and/or the College of Engineering. The Distinguished Alumnus/a Award recognizes outstanding professional achievement and service to Marquette University and/or the larger community. The Distinguished Young Alumnus/a in Health Sciences Award honors professional achievement under the age of 40. The Distinguished Alumnus/a in Nursing Award recognizes outstanding professional achievement. The Distinguished Alumnus/a in Service to Nursing Award recognizes outstanding service to the community. The Friend of the College Award recognizes a non-alumnus/a who demonstrates distinguished leadership and/or service to the College of Nursing. The Spirit of the College of Professional Studies Award recognizes contributions toward outstanding personal, professional or community transformation. The Leadership Excellence Award recognizes professional achievement through ethical leadership in service. The Distinguished Alumnus/a in Dentistry Award honors outstanding contribution to dentistry, whether through practice, research, education, administration or public service. The Outstanding Dental Service Award recognizes outstanding service to the community beyond Marquette University. The Alumnus/a of the Year Award recognizes distinguished professional achievement, leadership and service to Marquette or the larger community. The Lifetime Achievement Award is given to an alumnus/a who has reached and maintained a level of excellence in his/her lifetime. The Charles W. Mentkowski Sports Law Alumnus/a of the Year Award recognizes outstanding professional achievement in Sports Law. The Law School Howard B. Eisenberg Award honors a graduate of the Law School within the past 15 years for his/her dedication to the area of public interest law and/or service to the community. The recipient must exemplify living the Marquette mission of faith, service, leadership and excellence in his/her personal life and professional life. The Mary Neville Bielefeld Award is given annually to an alumna who demonstrates loyalty to the ideals of Marquette University. The Distinguished Alumnus/a Award recognizes an alumnus/a of Marquette who is a former athlete or former student athletic employee whose experience in athletics was integral to their student experience; distinguished professional achievement; leadership and/or service to Marquette or larger community; and loyalty to the ideals of Marquette University. The Lifetime Achievement Award is given to an alumnus/a who as a student was a member of MU athletics (e.g., athlete, manager, graduate assistant, etc.) and had a national impact on athletics or exemplary athletic achievement during his/her subsequent career. The Friend of Marquette Athletics Award recognizes distinguished leadership and/or service to Marquette athletics over a lifetime. The Young Alumnus/a Award honors an alumnus/a who is a former athlete or former student athletic employee; who has demonstrated significant professional achievement, personal responsibility, excellence and/or service to the university or community before the age of forty. NOTE: The above awards will be determined by the Athletic Board. The Hy Popuch Memorial Service Award honors an individual who has provided significant leadership and/or service to the M Club or the athletic department. NOTE: This award is administered by the M Club.